Iconic pedestrian bridge in Amsterdam. Flower like forms sculpt a path over the water along levitated botanical gardens creating new and spectacular vistas. 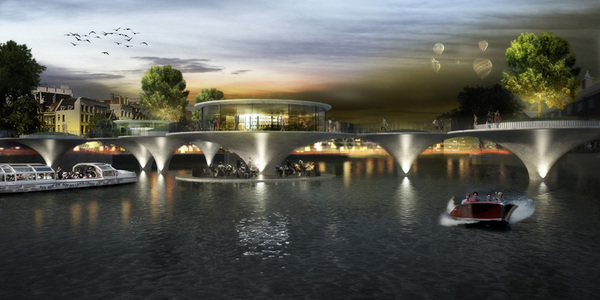 It challenges the stereotype of the bridge by creating new urban spaces above and at water level. The concrete structures, referencing the arched bridges of Amsterdam, are interconnected to create a meandering route and in the mean time producing structural stability. Botanical gardens are new feeding grounds for flora and fauna in the urban environment. It is sustainable in the essential way that it enhances the quality of life and livability of the city of Amsterdam. SunCycle panels on the green roofs provide the energy needed for restaurant, bicycleshop and lighting.